My first set of cast iron cookware. I love these, but a clean sock can do the job as well. If you’ve never cooked with cast iron cookware you have no idea how bamboozled you’ve been by the latest, greatest, non-stick pots and pans. Cast iron is the original non-stick surface with proper care, and it’s virtually indestructible. You’re more likely to have your cast iron cookware stolen, than damage it beyond repair. I’ve only witnessed one skillet damaged beyond repair – it was dropped on a hard surface and broke into two pieces. Which is in keeping with the material properties of cast metals – they aren’t beaten into shape, they are poured molten metal and as such have not been tempered in any way beyond normal use. They have no “grain” so to speak, the iron molecules align in a relatively unstructured manner and are therefore like poured ceramics which we all know will shatter if dropped. I’ve only lost two pieces of cast iron, my favorite griddle (featured in the Wenzel 1887 pic), and the skillet mentioned above, although it was someone else who dropped it. 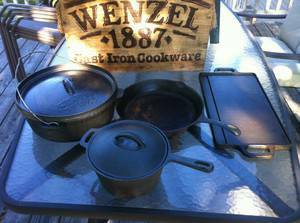 So what are the essentials of cast iron cookware? At least two skillets – I have four, including one just large enough to fry two eggs. At least two deeper pots with lids. At least one Dutch Oven. 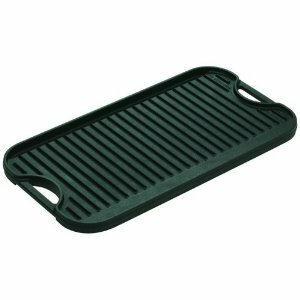 A Griddle large enough to span two burners on your camp stove. 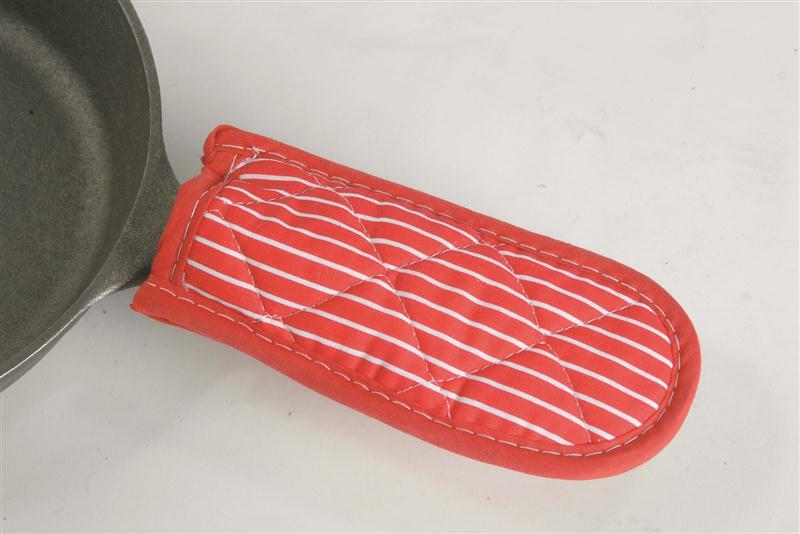 And a tool to safely remove the lids off of hot pots and ovens. Beyond that I’ve also picked up a couple pieces designed for Cornbread specifically, although I only prepare cornbread when I’m in the South – Go figure. The beauty of cast iron is its ability to evenly heat the entire surface, even if the heat source below is uneven. Of course this is predicated on the Cook pre-heating the pan properly prior to use. 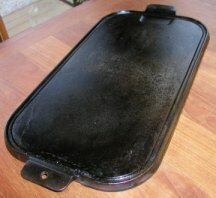 The internet is filled with Noobs who give up on cast iron after their first attempt, simply because they’re used to microwave cooking and natural gas stoves that almost immediately heat the inferior pots and pans they are used to. What happens if you don’t pre-heat a cast iron skillet before tossing in the makings of an omelet? You undermine the natural non-stick qualities of the skillet and there will indeed be hot and cold spots throughout the skillet creating a breakfast your dogs will enjoy far more than you. The other benefit of cast iron is ease of care! After you’re done preparing your meal, give it a wipe with a wire brush or steel wool, a cloth soaked in cooking oil (never use soap/detergent and water), keep it dry and it will be ready for your next meal. In my youth I managed restaurants and quickly realized the superiority of Stainless Steel and Enamelware to cheaper aluminum pots and pans. Even if you have a full set of cast iron cookware, you’ll want a few pieces of Stainless or Enamel for certain types of foods – Soups, some stews and anything with acidic ingredients such as tomatoes. Why? The acids in such foods strip the oils from cast iron, leaving it vulnerable to oxidation, which means you’ll have to season the pot or pan all over again. 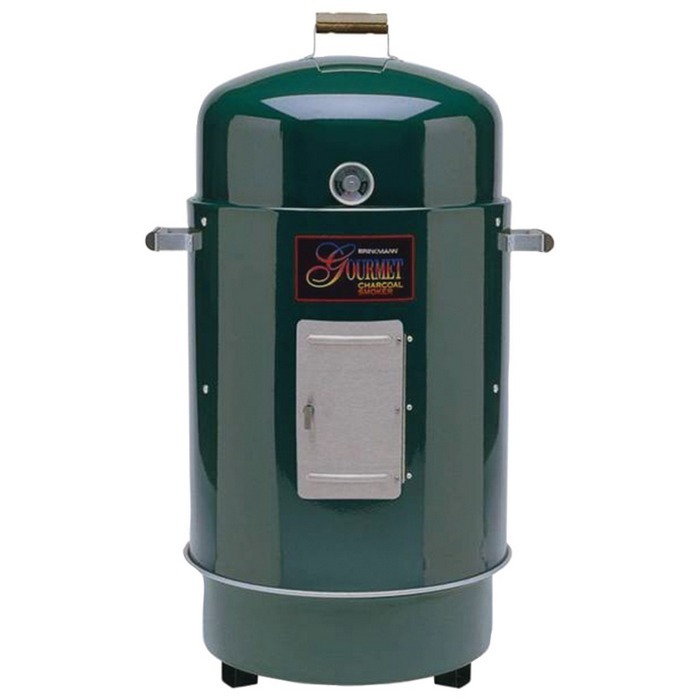 So what are the essentials of Stainless Steel or Enamelware? Small, medium and large saucepans/pots with lids. Mixing bowls of various sizes. Best tableware in the world. I prefer black, but blue is fine. Microwave? That’s for popcorn! On the road and in the wilds energy is visceral and a very real commodity. Yeah, you might come across an electric outlet and Wi-Fi from time to time, but this is real life we’re talking about. Leave the plastics at home. Better yet, recycle them even if you never travel and give the Earth a break. 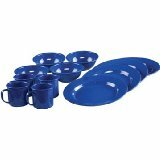 I have a eight place setting of enamelware plates, bowls and cups. Easy to clean, indestructible and dammit they look good, too. After spending a year in the wilds using nesting stainless tableware, I donated all the fancy stuff I used to own. 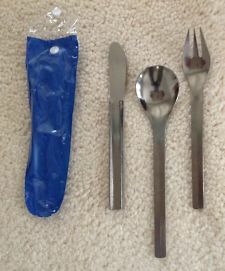 These serve all my meal-time needs and have a contemporary look to them. Steak knives don’t take up much room, don’t way much and there will be times you’re glad you had them handy rather than using your Buck knife to cut your meat. Even if you aren’t a coffee drinker, the rest of the world is – be sure you have a stainless or enamel percolating coffee pot. Not only is Camp Coffee the best in the world, when you get where you are going, you’ll likely toss your K-Cup or Drip Coffee maker after drinking real coffee and tea – Yeah, coffee pots make great herbal tea too! My favorite camp stove for the last decade or so is the Coleman Dual Fuel Stove (I can’t believe they’ve gone up $100.00 in ten years!) because they run on unleaded gas as well as White Gas (Coleman fuel). If you can get to a gas station, you can cook. No bottles of propane, no deposits, no returns, just fill up your gas can when you fill up your truck and you’re good to go. I’ve never used any of the “stoves” just big enough to heat my coffee mug, but it seems they’re all the rage with backpackers. Whatever; I think my cast iron cookware would crush most of these contraptions. 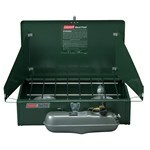 Don’t forget that a good folding grate over a campfire is still one of the best ways to prepare and enjoy a meal. More stainless steel. I’m not talking about tableware here, I’m talking about good tongs and forks for cooking over an open fire or your smoker. keg tap – One of the greatest ways to enjoy the great outdoors without having to run into town every other day is to dig a pit large enough for a keg of beer/trashcan, buy a keg of beer, set it in the trash can (which is already in the pit you dug). toss in a bag of ice and enjoy your favorite brew for days even during the dog days of Summer. The pit keeps the bottom of the keg at about 50 degrees, while the ice brings the temperature exactly where you want it to be. 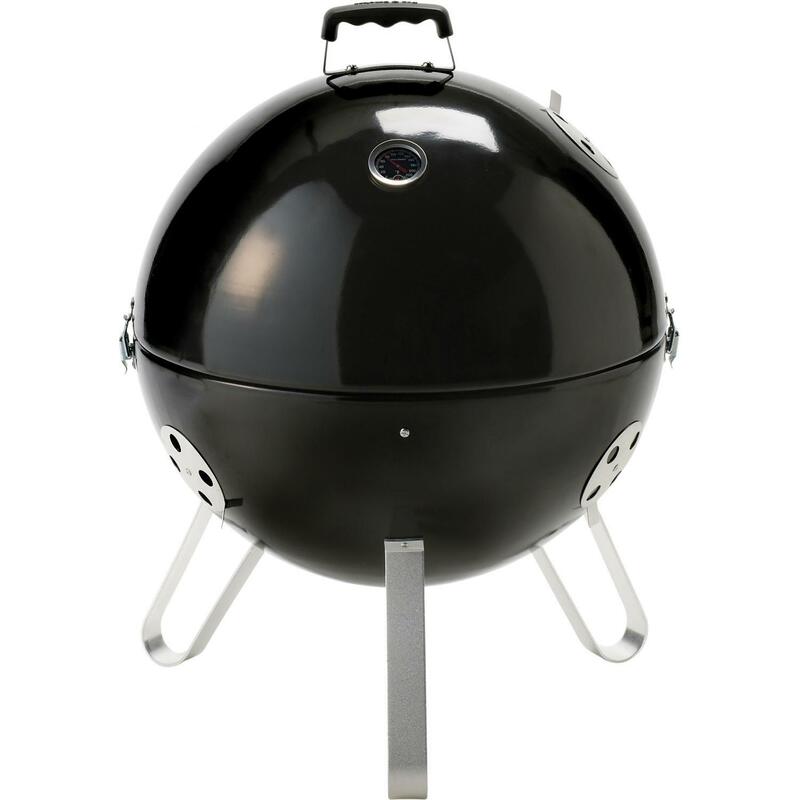 Smoker/grill – Although I do most of my cooking over an open fire or over the embers of a fire, a small, portable smoker/grill is essential, especially during inclement weather, or when you have a ten pound wild turkey to roast and smoke, cuz there’s no way you and the dogs will eat it all in one sitting. Chimney type charcoal lighter – Although I’ve purchased these in the past, when in the wilderness, I make my own out of empty coffee cans. Knife sharpeners – yes plural, including oil/wet stone. While some sharpeners will be great for kitchen knives, Buck, filet kinves, hatchets and axes need a personal touch. C-Clamps and Metal file – Your hatchet and axe may be your primary source of fuel at times, so be sure you have the tools to keep them at their optimum. The Boot-Strap Expat Is Taking Requests! Tell Me What You Want More of.